Monsignor William J. Linder, a pioneer in America’s community development movement who founded New Community Corporation in 1968, passed away June 8. He was 82. New Community is a nonprofit organization that transformed a blighted area of Newark following the 1967 riots by building new housing and providing critical services like job training. Under Monsignor’s leadership, New Community grew from a single housing development to an entire network of facilities and services, today encompassing close to 2,000 units of housing for seniors and families in three New Jersey cities, in addition to providing child care, education, health care and a host of other services that make it one of the most holistic in its approach in the community development arena. Monsignor’s goal from the very beginning was ambitious, radical and unlike anything ever attempted in an inner-city environment at the time: creating a planned community within an old, existing city that would provide residents with all the services they need from birth to death. The model of community development Monsignor created attracted visitors from around the world, including places like Ireland and Africa. His work also drew the attention of leaders like Bill and Hillary Clinton — she visited New Community back in the 1980s. Former South African Bishop Desmond Tutu and Former U.S. Housing Secretary Jack Kemp also visited. Today, New Community owns and operates its own nursing home; a 102-apartment transitional housing facility for homeless families called Harmony House and New Community Workforce Development Center, an accredited post-secondary career and technical school offering programs in automotive technician, building trades, culinary arts and health care. Monsignor was also the catalyst behind the opening of the Adult Learning Center and a charter school in the city’s West Ward in 2011. Against the will of the city’s political leadership, Monsignor, back in the late 1980s, is credited with opening one of the first child care centers in the nation and the first in New Jersey for infants and toddlers suffering with HIV/AIDS, one of his proudest accomplishments. He was never one to back away from a confrontation if it meant that in the end a mother, grandmother or child would receive the benefit. Through Monsignor’s vision and leadership, New Community recently finished construction on A Better Life, a supportive housing facility for the chronically homeless. The building offers studio apartments each with a private bathroom and kitchen area. Born in Jersey City on June 5, 1936, Monsignor grew up in West New York and enrolled in Manhattan College to study engineering in 1954. However, halfway through his freshman year, Monsignor’s father suddenly died at age 53. Monsignor finished the semester at Manhattan College and then spent the next two years at Seton Hall University studying classical language and philosophy. In the fall of 1958, he entered the Immaculate Conception Seminary, where he spent his next six years. Monsignor was ordained as a priest on May 25, 1963. At age 27, Monsignor received his pastoral assignment for the all-black parish called Queen of Angels in Newark, and founded New Community with a small group of community-minded residents in 1968. In 1973, Monsignor was abruptly removed from Queen of Angels and exiled to the dormant St. Joseph Parish in Newark. In 1974, he was reassigned to St. Rose of Lima Parish in the Roseville section of Newark, where he became its pastor in 1977. Monsignor retired as pastor of St. Rose of Lima in 2012 at age 76. 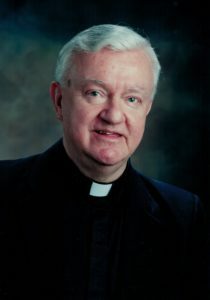 Monsignor previously served as the CEO of New Community Corporation. He was serving as the president of the New Community Corporation Board of Directors and remained active within the organization until his death. Thursday, June 14 from 4 to 7 p.m.
Thursday, June 14 at 7 p.m.
Saturday, June 16 at 11 a.m. In lieu of flowers, the family has asked that donations be made to the Monsignor William J. Linder Scholarship Fund. Donations can be sent to 233 West Market St., Newark, NJ 07103.